Liverpool manager Rafael Benitez has vowed to start rebuilding his side immediately after the Champions League final defeat by AC Milan in Athens. Out-of-contract players Jerzy Dudek and Robbie Fowler are leaving and Benitez revealed Mark Gonzalez and Boudewijn Zenden may follow them out of the club. 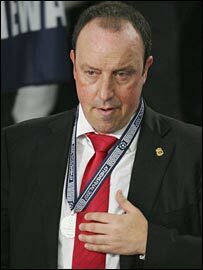 "We have a deal nearly completed for Gonzalez and I have told Bolo that he can talk to other clubs," said Benitez. "We must quickly sign our number one targets and spend big and spend now." Benitez is eager for Liverpool to close the gap on Manchester United and Chelsea and club owners George Gillett and Tom Hicks agree with his vision. "Our fans know what we must do and so do I," added Benitez. "When you look at the champions Manchester United spending £20m on a midfield player and we have been paying only £8m to £9m for our strikers, you know what must be done. "I have been told by the new owners that they will back my plans. "If we wait we will be chasing the players who are second and third on our list. We need to change the structure of the club on and off the pitch." Liverpool finished third in the Premiership this season and Benitez added: "We need to pay the price needed for each position. We have finished 21 points behind United and 15 behind Chelsea. "They will both spend big money again and we will just be marking time. If we continue the way we are we will be fighting for third or fourth spot again at the end of the season - and we cannot have that all the time. "Two seasons ago we got 82 points, a club record, and we could not get into the top two. If we do not improve now we will always be fighting for fourth spot. "It is obvious we do not have enough players for nine months competing in four competitions."